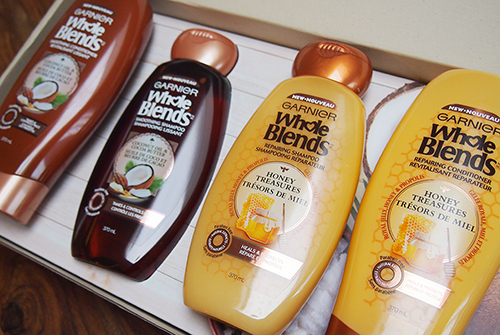 Earlier this year, I noticed my local Shoppers Drug Mart had set up a giant display for the Garnier Whole Blends line of haircare and, of course, I couldn't help but wander over to take a look. After all, whose interest wouldn't be piqued by combinations like Coconut Water & Vanilla Milk, Green Apple & Green Tea, or Avocado Oil & Shea Butter? Lucky for me, I was sent a few of the blends to try for myself! The concept behind this new (and very affordable -- MSRP is $5.99) line is a selection of natural blends targeted to different haircare concerns that are paraben-free and with "gentle & effective sulfates". Now, I'm aware that some people don't like to use sulfates, especially because they tend to strip colour from dyed hair. This is always a concern for me since mine is bleached but since I have been alternating my Whole Blends products with purple shampoo and conditioner, I personally haven't seen any negative effects. 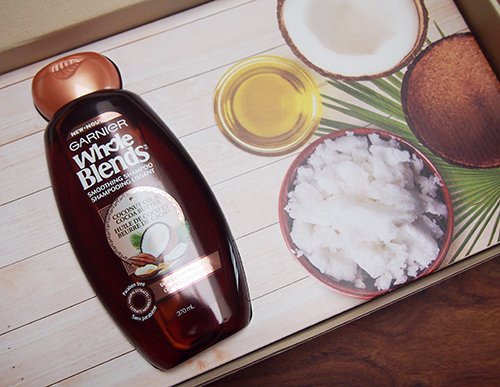 The Coconut Oil & Cocoa Butter blend will appeal to any coconut lovers (that would be me!). Infused with South Pacific Coconut Oil and Cocoa Butter sourced from West Africa, this blend smoothes hair and controls frizz. I have also been loving Honey Treasures, which combines nourishing Honey, revitalizing Royal Jelly, and protecting Propolis to strengthen and heal damaged hair. This is a good one if your hair is prone to breakage and it also smells delicious. I love these products they are right now my favourite drugstore shampoo right now. I had samples of the coconut water one and loved it, I find them really refreshing. I have the green apple/green tea one and it's very clarifying. It gets everything out of your hair it breaks up the buildup nicely with out using too much product. Really love the line, really want to try every shampoo from this line. I had no idea there was a lemon one -- we definitely don't have that blend yet! Would love to try these but I don't think they're available in the UK! Great price point though for something that has gentler elements. Thanks for sharing! I'd have to look out for these!